Disable Windows Key(s) on Keyboard connected to a Windows Computer with Daanav Disabler. This Free Keyboard Control Utility allows you to Disable Selected Keys and Keyboard by Enabling Keyboard Filter Driver supplied by Microsoft Windows. Apart from Left & Right Windows Keys on Keyboard, you can even disable the Caps Lock Key and Left Ctrl Key on Keyboard. In order to disable keyboard keys, all you need to do is run the Daanav Disabler and mark the keys you want to be disabled. Once you have marked the keys to be disabled for all users of this Windows Computer, click on OK. Your Computer needs to be restarted in order for changes to be effective. 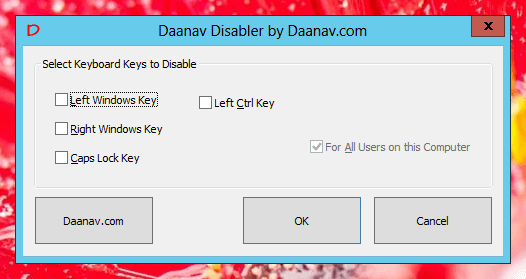 Have a look at the given below screenshot to view what all keyboard keys you can disable with Daanav Disabler. Download this Free Windows Software Utility to Disable Keyboard Keys. Whenever changes are applicable to all users of a Windows Computer, the software applications needs to be run with admin access. When you disable any keyboard keys with Daanav keyboard Disabler, you would need to Restart the Computer. The Software Utility will ask whether you want to restart your computer or not after saving the changes to the registry database. This Free Windows Utility works fine on Windows Versions including Windows XP, Windows Vista, Windows 7 & even on Windows 8. Yes you do not need to worry about 32 bit or 64 bit length of your operating system as this Daanav Disabler can be used to disable Keyboard Keys on both 32 bit and 64 bit versions of Microsoft Operating Systems. In case you would like to disable more keyboard keys or get some custom built software developed as per your requirements, please do contact us to get custom software development services at affordable prices.